Welcome back to another week of Five Minute Friday! So glad you’re here! If you missed the grand announcement earlier this week, the votes have been tallied and the results are in for the 2015 edition of 31 Days of Five Minute Free Writes, Readers’ Choice Awards! 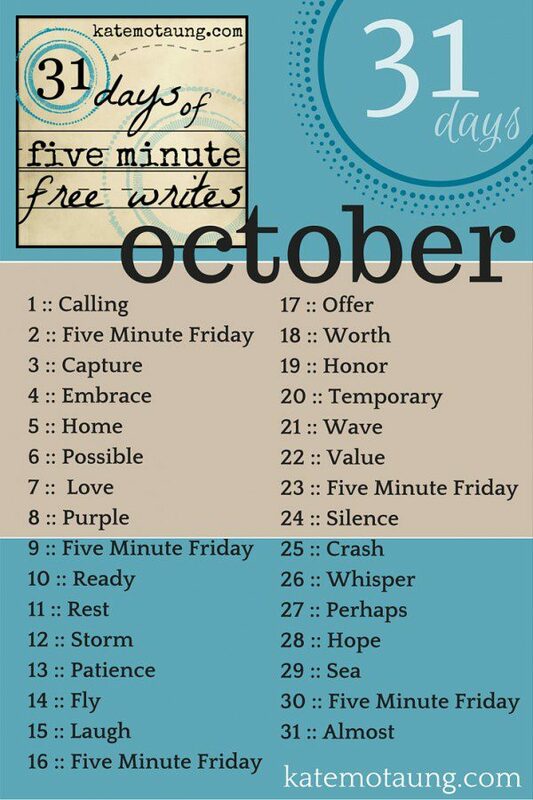 For more info about 31 Days of Five Minute Free Writes, click here. I have a love/hate relationship with same. I hold a baby close to my chest and breathe in the curls of his hair, and I want the moment to last forever. Just lay here and sleep with your breath on my shoulder, and let me rock us both without a sound until Jesus comes back and all is right in the world. I want to freeze time and keep the still frame in my mind, without a single change. But time resists and I lose my appeal and most days my fickle heart gets antsy and longs for new. New scenery. New routine. I strain to get out of the rut of discontentment by reaching toward anticipation. I celebrate diversity and unity in one breath. We’re all broken sinners in desperate need of unchanging grace. In desperate need of the One who is the same yesterday, today and tomorrow. 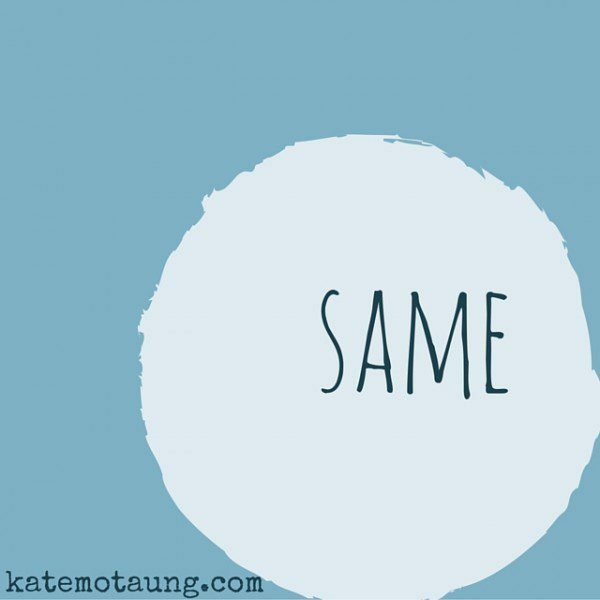 Join us for five minutes of #free #writing on the prompt, SAME. Thank you for saying these words that I was trying to say but they turned out differently. We are the same and different all at the same time aren’t we??? Love that you host this every week and open up your blogging home for 100 of your closest friends!!! Love you girl! I’d say that there was a time I wanted time time in stasis…many times…but my only real prayer now is God, please give me tomorrow. Amen! I’ve been trying to teach my students this concept–but they come from a world where ‘no one’ can understand them and the ‘white man’ has been the oppressor. I keep praying that one day they’ll understand so that they can be free to live freely in God’s love. Thank goodness Jesus IS the same yesterday, today and forever. And that He is always there for us, forgiving and loving us. So thankful for like-minded sisters who share the same qualities. I took a different slant on the word prompt. Love when I get to join you! So true, Kate. As someone once said, “We all bleed red.” And so did our Savior for each one of us. It is always good to join you! Beautiful post. We ARE all sinners in need of a SAVIOR who is always THE SAME! Blessings. I’ve only read a few FMF posts so far but I’m curious to find one writing on “same grace” – going to #1 and reading through – it may take all day but feels as though it will be well worth it! (Side note: I love change and embrace it YET so grateful my awesome BIG GOD never changes His Grace and Mercy toward me.) xo Thanks for your faithfulness to FMF. Kate, I just want to say I’m grateful for this group and this link up. With life so upside down and inside out, this keeps me posting each week on my blog during a time when I just can’t keep up with my “platform building” any other way. So, thanks. I want to catch up with the book study. Maybe over the weekend. I hope you have a great one! Thanks so much for hosting this and being a place for connection, reflection and encouragement. Wonderful to have you with us, Jasmine! Beautifully said, Kate. Yes- now that you said it so poignantly, I realize that I have a love-hate relationship with same as well! I’ve been thinking a lot about the seasons as well, Kristi! As much as the change is sometimes unwanted, the familiarity is certainly a blessing that points to the faithfulness of our unchanging God. Thanks for the comment!